A LUAS-type light rail system for the greater Galway area could provide a very attractive alternative to the car. Light rail has emerged in recent years as a very popular addition to public transportation systems worldwide. New light rail systems have been recently implemented across Europe in Strasbourg, Stockholm and Manchester. LUAS in Dublin has been a remarkable success. 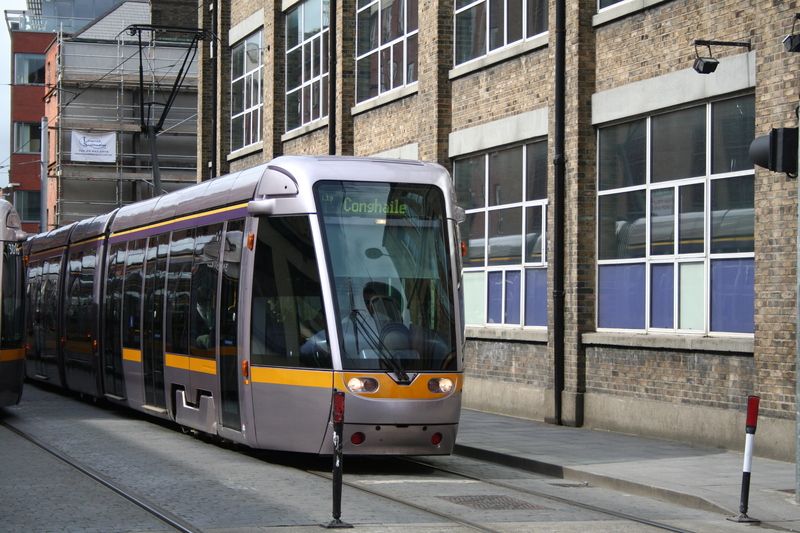 There are currently two separate proposals for a light rail system in Galway: GLUAS and SUIG. – As such a system would have dedicated tram paths and be almost completely independent of the road traffic and be given priority at road junctions, it would offer a reliable service with minimum travel times. – Commuters from the main road thoroughfares into the city could be accommodated by lines that run from Bearna, Moycullen, Ballybrit and Oranmore into the city. – Both design proposals connect the main residential areas with the city centre and with the main industrial estates in the east of the city. – With long carriages and greater frequency during busy periods, a tram system would have a high capacity to cope with large passenger numbers when it is most needed. – Trams are more accessible to people with physical disabilities. Trams operate at kerb level so boarding trams is easier for wheelchair users. – There is a high degree of passenger comfort on a light rail system. With spacious carriages and excellent suspension, trams offer a very smooth ride. – Land values near stations and along the lines would increase. – There would be increased footfall for businesses near tram stations. – Rundown areas near stations can be regenerated with new commercial and residential development. – Districts that undergo urban regeneration close to stations can be developed at higher densities so more people can live nearby and use the service to get around. – Park and ride facilities can be installed near stations especially at the edge of the city. – The lines and stations would be located so as to maximise integration with the bus and train services so as to allow passengers greater flexibility and choice. – Such a system would be a great asset for tourists visiting the city. – A light rail system would be viable in a small city such as Galway. There are light rail systems in at least 14 European cities smaller in size than Galway including: Halberstadt, Germany (population 40,526), Valenciennes, France (pop. 41,278); Brandenburg, Germany (pop. 71,778). – Trams are more environmentally friendly as they are powered by electricity, which could come from local renewable sources such as wind making it even greener.